Hello there, I am delighted to be hopping along with Altenew for their May 2018 stamp & die release today. It is a wonderful release with something for everyone but today, I decided to focus on creating some simple floral cards where the focus is the flowers. My first card uses the new Starry Flowers stamp set. I started off by stamping the larger of the two floral images from the set on to watercolour paper, using Versamark Ink. I applied white embossing powder and heat set. Using an ink blending tool, I applied inks from the Sweet Dreams Ink collection on to the panel. I used all four of the ink colours starting darker at the top and moving to lighter shades at the bottom. I then misted over Iridescent Ink Spray and also added some larger drops for some added interest and shimmer. While the panel was drying, I took one of the sentiments from the set and stamped this on to black cardstock with Versamark ink. I applied white embossing powder and then heat set. This was cut in to a strip. I adhered the image panel to a white A2 card base with foam sheet and DST and then added the sentiment on top with clear foam tape. My second card uses the new Fabulous Floral stamp set. This is a wonderful layering set with two flowers and a few different leaves. I started off by stamping one of the flowers on to a 4" x 5.25" panel of white cardstock. I used the Glacier Caves Ink collection and started with the lightest colour at the bottom for the larger layers, moving up to the darker colours for the smaller layers. I also used black for the flower centre. The flower was masked off and then the other flower from the set stamped using the same colours, before removing the mask. This makes it look like the first flower is in front of the second. Both flowers were then masked off and the leaves stamped using the Green Fields Ink collection. I used all three shades of green from the set. The panel was then adhered to a white A2 card base with foam sheet and DST. I then took a sentiment from the Strawberry stamp set and stamped this on to black cardstock, white heat embossed it and cut it in to a strip. This was added to the card with clear foam tape. To finish off, I added a few Sparkling Clear sequins. Since I really like how the flowers looked in the blue, I decided to create a tag as well. I free-hand cut a tag from white cardstock and stamped one of the flowers and leaves in the bottom right hand corner using the same inks. I then stamped a sentiment from the Sentiments and Quotes stamp set in the top left hand corner. To frame the tag, I used the new Fine Frames Rectangles dies. These are thin frames and I think they worked particularly well for this tag, bringing the focus in to the middle. For the hop, you should have arrived here from Laura Jane. The next person on the hop is Erum Tasneem. For the full list of participants, or to start the hop from the beginning please visit the Altenew Card Blog. To celebrate the release, Altenew is giving away a $50 gift certificate to 6 lucky winners! 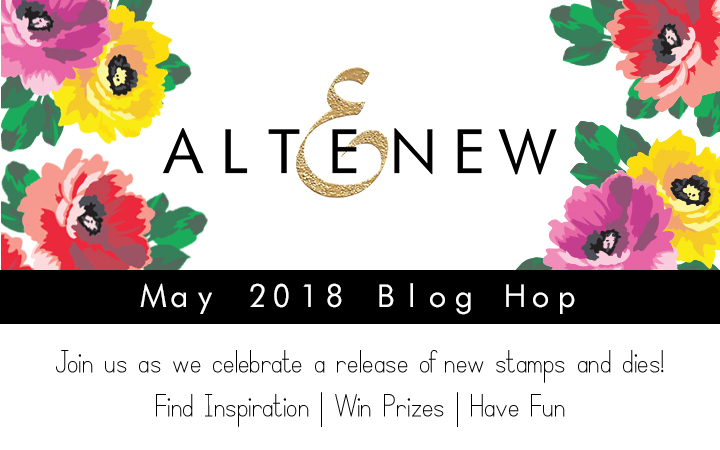 Please leave a comment on the Altenew Card Blog and/or Altenew Scrapbook Blog by Friday 26th May 2018 for a chance to win. The 6 winners will be announced on the Altenew blogs on the 27th May 2018. I am also giving away a $30 gift certificate to the Altenew store to one lucky winner. Please leave a comment on this post by May 25th 2018 at 17.00 hrs BST/ 12.00 EDT. I will announce the winner on May 26th. Good luck! Thank you so much for visiting me today. I hope you have a great time on the rest of the hop and have a fabulous day! GASP such GORGEOUS gorgeous Blues! So great to have taken part as a guest with you on this Release! These are so so pretty, Michelle! I love your blue background! I love the rich blues you have used on a card and tag!! Such beautiful blue shades in your elegant cards!!! Lovely...These are all so beautiful and colorful...I am simply admiring each bit of your creativity!! I just love the shades of blue...so beautiful! Thank you, too, for showing us how you covered up little mistakes...it's so helpful to learn from your boo boos, and also to see how you filled in the blank areas around the mask. Your cards and tag are gorgeous! Love the simplicity of these cards-nice contrasts! Those skinny frames really bring your tag to life! I love the blues you've chosen for the flowers. Very pretty! I love the blue! Wow! Love your beautiful cards are tag! The blue is so pretty! Thanks so much for sharing! 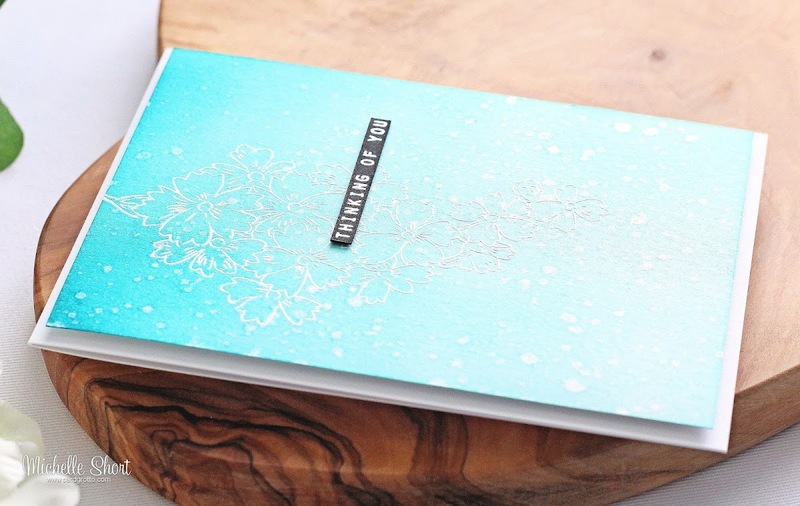 this one is really pretty with the embossing. These are gorgeous! Love all the blue! The tag with the fine frames make it very delicate and gives it an elegance. Stunning! These are all so beautiful and truly and wonderful set. I love how subtle the first card is in the background and I am a sucker for any deep hued blue so these are totally up my alley. Both cards and the tag are just so lovely, thank you for the nice video outlining your steps! Love all of your projects. SO pretty! Your cards and tag are beautiful ! Absolutely beautiful cards & tag! Thank you for the wonderful inspiration! Lovely blue shades for all three of your projects!! Love the resist, iridescent card using the Starry flower stamp! I love your blue flowers! Really pretty! Beautiful blue flowers. Love your use of space and color scheme. I love the masking you did in that second card.That Fabulous Floral stamp is hot! So simple yet beautiful cards. Blue is my favorite color! Love your cards. love that bright blue in the second card and the tag!! These are really beautiful cards! I am loving your blue blooms and the placement of them. Perfectly CAS! Love!!! I just love your clean and simple style... your cards and tag are stunning! So pretty! I love your use of blue for these flowers - unique and really artistic! The cards and tag are absolutely beautiful! Lovely! Love the blue theme! I have to get the thin frame die NOW! Gorgeous!! I love your Starry Flowers card! Such a pretty color of soft blue. Lovely!! Gorgeous!! The starry flowers set is my new fave! So so very lovely! I love your color combinations! This is such an awesome release! So pretty. I love the new rectangle frames. 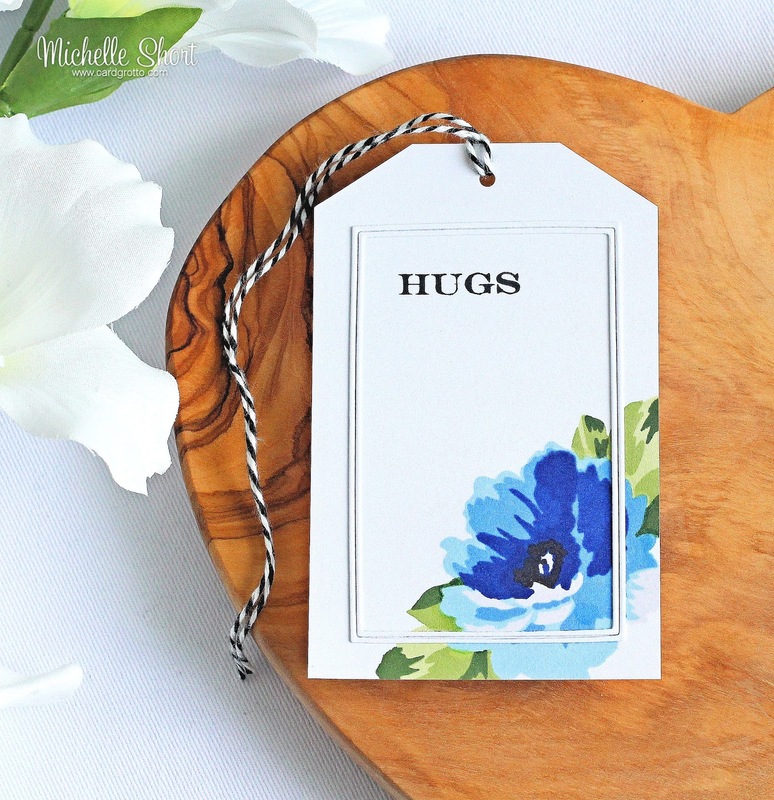 Love the card and tag in those rich blue fabulous florals! What wonderful cards (and tag) and an informative video. I truly appreciate the tips along the way. Hi Michelle, Love the cards, they are all gorgeous, TFS, Cheers Anna. Love the fabulous florals in the blues...the tag is a special touch. Beautiful cards and I love the dimension you added to the tag using the frame dies. Thanks for sharing. Oh the blue! Love them all. Great cards! Love the blue and then ink blending is so pretty. Beautiful job. Lovely cards Michelle. The floral images are so pretty and I love the pretty blue hues! Love your cards! Simple and beautiful! Thanks for sharing them! Your blue flowers are luscious!! Lovely projects! You bring such a light and soft elegance to your work. Gorgeous, gorgeous, GORGEOUS! I just LOVE the matching card and tag! What a brilliant idea! Love that rich blue color palette too! So pretty - love all that blue. I really appreciate you taking the time in your video to go through how to get 6 colors from a 4 color set. You have assuaged some of my fears that I would get lost on the nth layer. Also, Glacier Caves is one of my favorite ink sets ever, so I'm always excited to see people use it. I love how your cards turned out, and I love the little details you added to finish them off. You gave me lots of ideas, so thank you for that. Beautiful cards and tag, I love the fine frame detail to draw focus to the flowers and the ombre background with the Starry flowers is gorgeous. Beautiful cards! 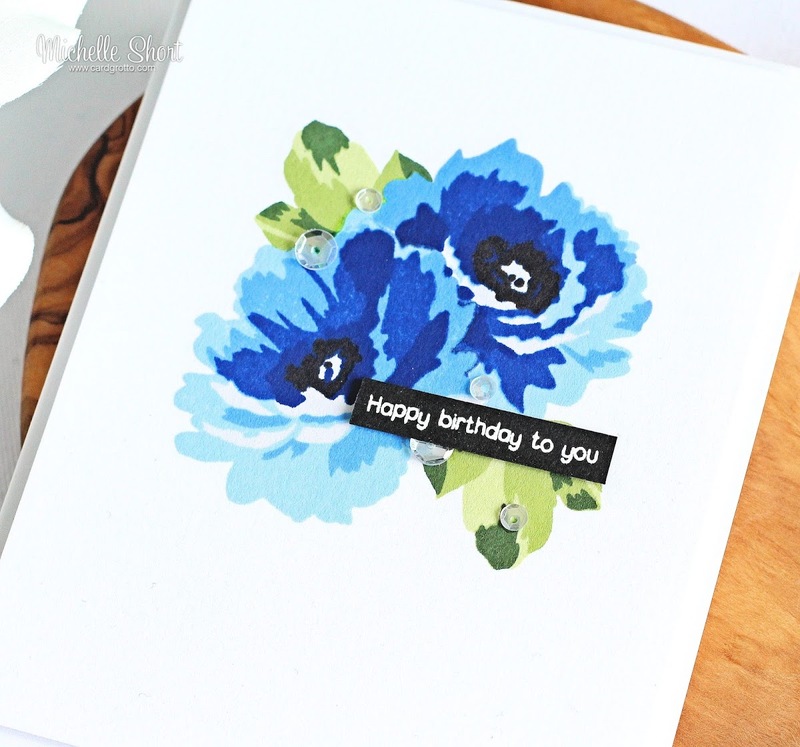 I love the vibrant blues you used on the Fabulous Floral card and tag. The fine frames work so nicely to direct your focus to the flower. Thanks for sharing! You always did an amazing job! Love every one of these cards! Simply beautiful. These are all amazing Michelle, the blue flowers are so vibrant and beautiful. The tag is so beautiful. ♥ it! These are beautiful. I especially love the tag, I think because of the rectangle frames. I really love that die set! I absolutely adore how you used that frame on the tag...wonderful ideas! Really beautiful! I love the blues. Each of these cards is awesome. Also love the tag. That shade of blue is awesome. Loving the use of blue Niall your cards. Such a calming color. 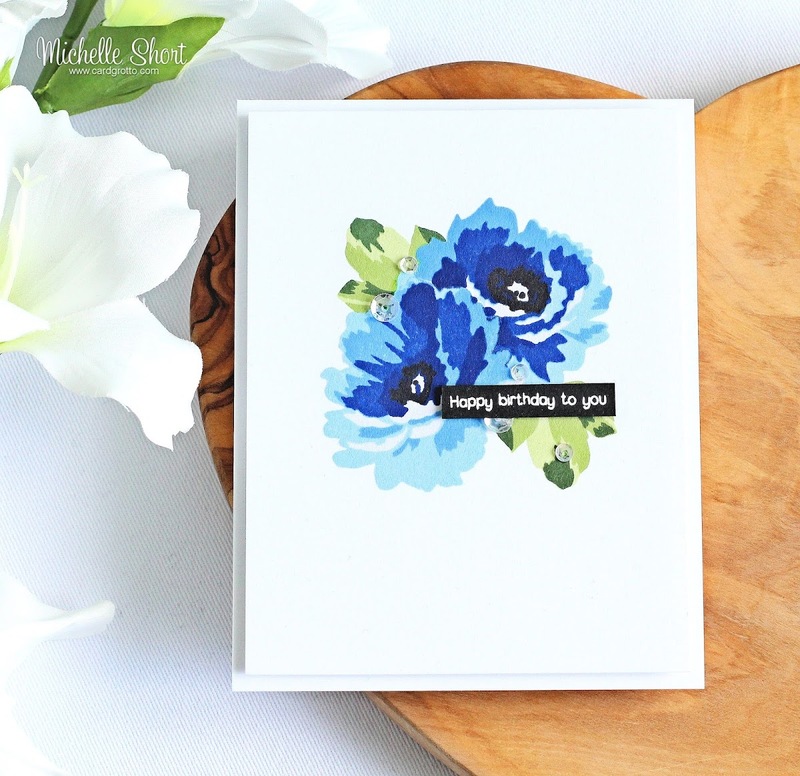 The blues in your stamped flower images are simply marvelous! Love how bright and vibrant they are! 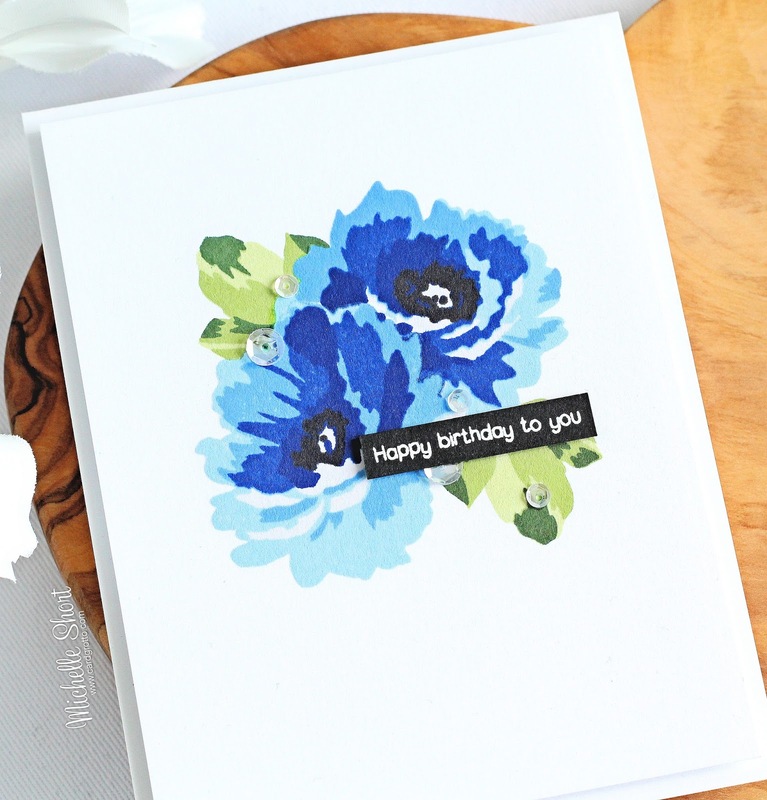 The embossing you did with the flowers with the blue background really grabbed my attention too! Wonderful ideas and thank you for sharing. Love the blue watercolor flowers! These are beautiful. Although I really liked your first card with inking over white heat embossing (one of my favorite all time techniques)...I was really wowed by the vibrant colors on your second card & tag! Gorgeous cards and tag! The Starry Flowers set is a favorite! The Fine Frames die sets are awesome too! Lovely cards. The white space allows the blue flowers to shine! Gorgeous cards. Love your florals and video! I finally made it through this very long hop to one of my very fav designers! Love your cards, pinnning! Elegant floral cards! Love your beautiful color choices and the designs. Thanks for sharing your creativity! Beautiful, elegant projects. I love the colors and the layouts. Especially love the Fabulous Floral card and tag. So bright. Beautiful cards! Pretty cards and matching tag. Gorgeous! Who doesn't love a blue card?! Such awesome cards! I especially love the tag - super cute idea! Love the blue theme. So much inspiration. The tag is awesome. Thank you! Beautiful blues!! Love all the varied techniques and design styles you used on your projects. I especially like the gorgeous flowers you created on your second card and tag. I am really falling for the Fine Frame dies.... love how you used them on the tag. That little bit extra added so much interest. TFS all your ideas and inspiration. I love the ombré card but all are gorgeous!! Beautiful set of cards & tag, I love the colours in particular.